There's activity at 27 Wooster. I don't know when the design was changed, but I like what KPF has done. A reasonable modern expression in an historic district. A reasonable modern expression in an historic district. Reminds me of the elegance of Manny Hanny on 5th and 43rd. The nasty sink hole here has finally been dewatered. 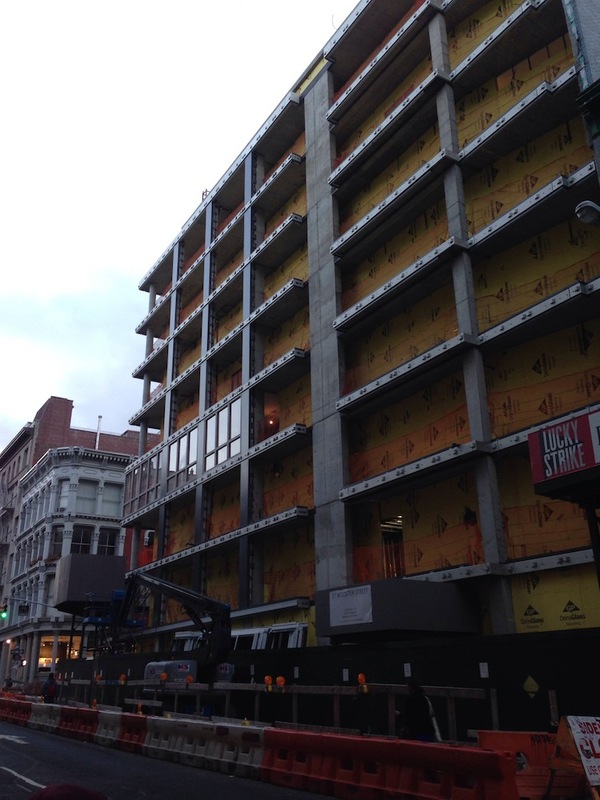 The foundation is in and it's now rising above the street, with the first floor nearly complete. I need a new camera. 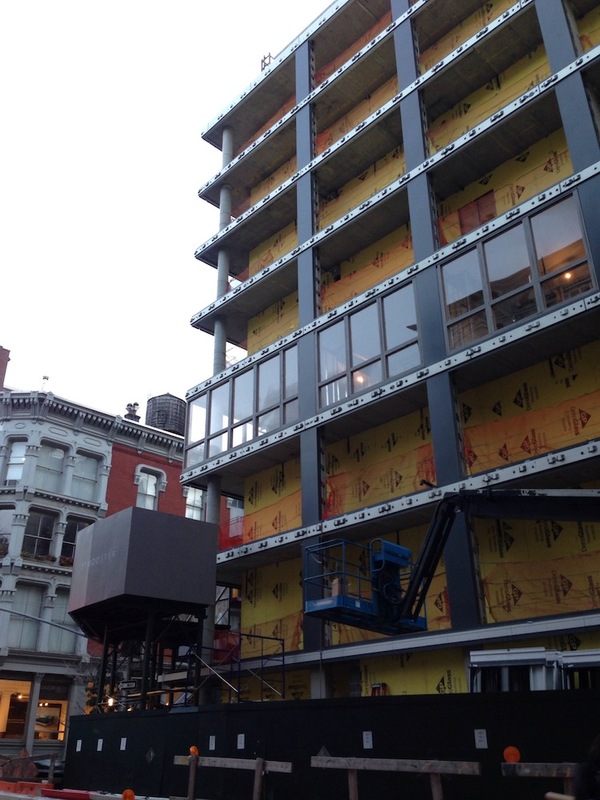 The windows are coming in at Soho’s 27 Wooster Street, designed by Kohn Pederson Fox. 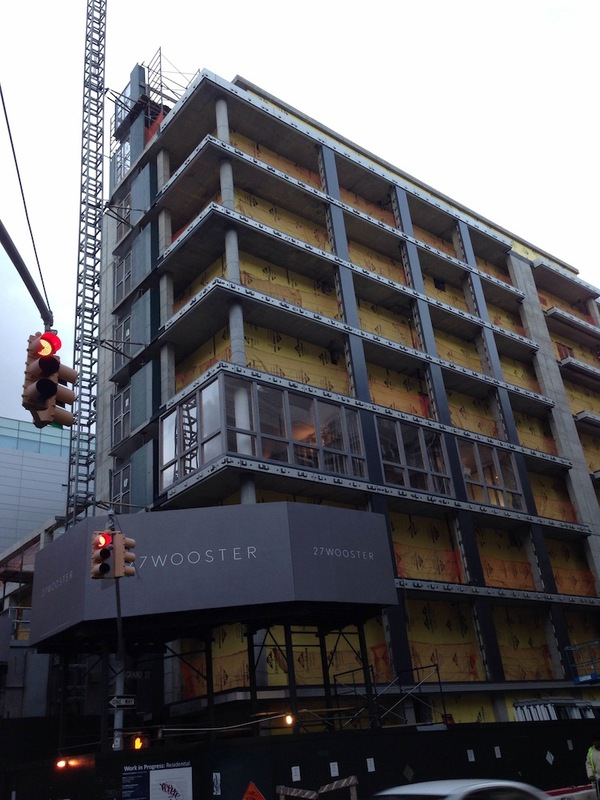 Axel Stawski and Anthony Leichter developed the 16-unit project on the corner of Grand and Wooster streets, with Thomas Juul-Hansen on interior design duty. 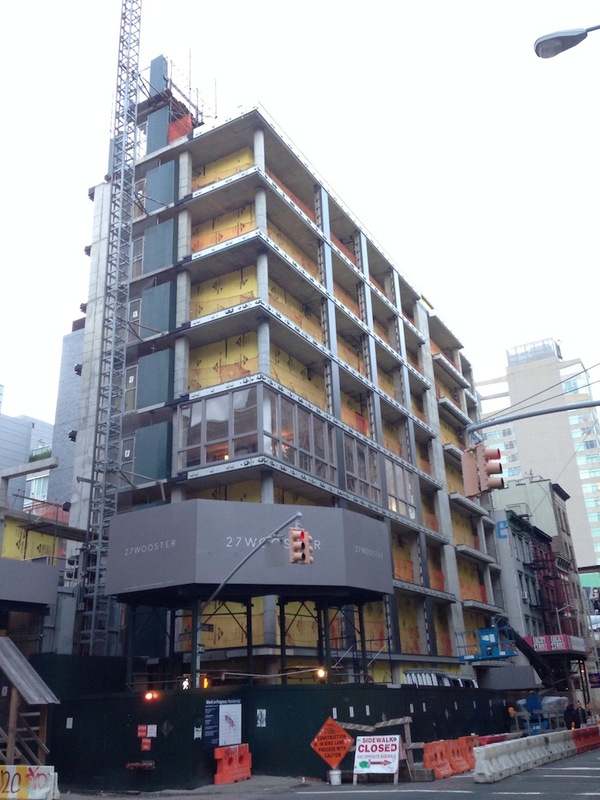 The first two units hit the market in May, with asking prices of $6.35 million for a 2,425-square-foot three-bedroom and $6.55 million for a 2,500-square-foot three-bedroom, according to Curbed. Every apartment has floor-to-ceiling windows that extend fully to the outside, direct key-locked elevator entry, wide plank white oak floors and Smallbone kitchens with marble countertops, marble islands, Sub-Zero refrigerators and Miele dishwashers. The 6,700-square-foot penthouse, on the market for $28.5 million (or $4,253 per square foot), boasts 75 windows on the lower level, 13 all-glass sliding doors on the upper floor and a private outdoor 33-foot-long swimming pool. The living room has a marble-clad fireplace and leads to 3,100 square feet of terrace space. The master bathroom has marble slab floors and walls, bleached zebrawood cabinetry and double rain-shower heads with steam shower. Amenities include a 24-hour attended lobby, cold storage, gym, bicycle room and available storage and parking.